NOT long ago China was a leading culprit in global economic imbalances. Whether blame was ascribed to its undervalued yuan or its frugal people, the problem seemed clear. China was selling a lot abroad and buying too little back. One data-point summed this up: its current account surplus reached 10% of GDP in 2007, well above the level that is generally seen as reasonable. Far less attention has been paid to its steady decline since then. 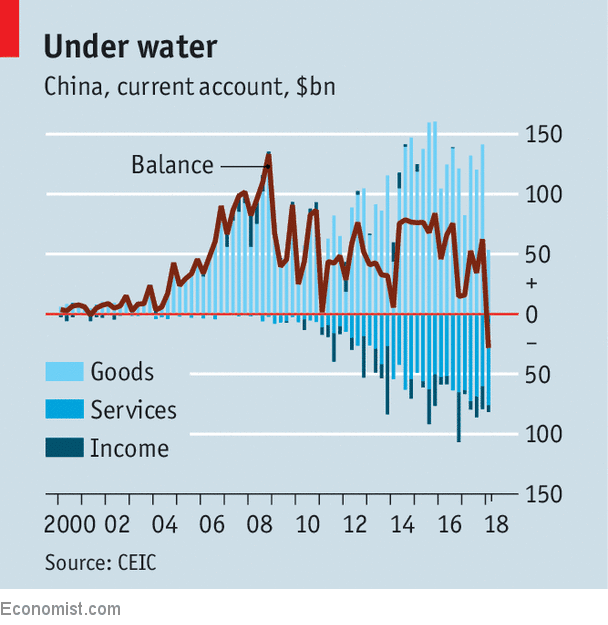 In the first quarter of 2018 China ran a current-account deficit, its first since joining the World Trade Organisation in 2001. Just as its massive surpluses of yore had big consequences for the global economy, so does this swing in the opposite direction. Needless to say, this didn’t sit well with Iran, which has been cooperating with Russia in support of the Assad government. Iran rejected Russia’s announcement, insisting that it deployed its military at the behest of the Syrian government. Iran has its own reasons for being in Syria, of course, regardless of what the government in Damascus wants. It means to establish greater command of the Middle East and acquire land access to Lebanon and sea access to the Mediterranean. Even if this territory isn’t under its direct authority, Iran wants to keep Israel and Turkey from encroaching on its borders. In the process, Iran, the de facto leader of Shiite Muslims, hopes to quell Sunni resistance, which, as the Islamic State showed, can be a potent threat. Russia shares none of these goals with Iran. The two may tactically work toward the same goal – keeping Assad in power – but cooperation between Russia and Iran has always been a marriage of convenience, not a true alliance. Russia needs to prevent any one power from controlling too much of the Middle East. A state that eliminates competition in the Middle East would be able to look north, to the South Caucasus, a critical buffer region for Russia. Any power that can gain a foothold in the South Caucasus threatens the North Caucasus, which, in turn, threatens the Russian heartland. Russia must keep Middle Eastern powers competing against one another if it is to prevent any single actor from cementing a position of strength in the South Caucasus. Russia and Iran’s interests also diverge on oil. The government in Moscow relies heavily on oil and natural gas revenue, so any increase in the price of oil benefits Russia. Iran has a relatively low fiscal breakeven point for producing oil – it can turn a profit when oil is roughly $55-65 per barrel – so it could afford to produce more to keep prices low. Now that the Iran nuclear deal is all but dead, uncertainty around Iranian production has driven up oil prices, giving Russia a little more breathing room. In other words, sanctions on one U.S. enemy, Iran, benefit another, Russia. Then there’s Israel, with which Russia has friendly relations. Iran’s expansion has begun to invite attacks from Israel, which objects to having an Iranian presence so close to its northeastern border. While Russia is content to bomb rebels in Syria who have no real way to defend against air attacks, it is far more apprehensive about getting caught up in a war against a country with a powerful military and strong motivations to intervene. Israel’s fight isn’t with Russia, and Russia’s isn’t with Israel. But Russia and Iran’s joint support of Assad nevertheless risks pitting Russia against a country it has no interest in fighting. This explains why Russian declined to retaliate after Israel attacked Russian anti-aircraft installations controlled by the Syrian military. In fact, Moscow didn’t even mention the incident. Sure, the installations in question were outdated, but the fact that Russia decided against selling Syria a more modern air-defense system, the S-300, a day after Prime Minister Benjamin Netanyahu’s visit to Moscow illustrates Russia’s desire to avoid providing Syria with the capability to damage Israel’s air force. In Syria, a successful show of Russian force requires a victory and an exit strategy. Claiming that the Syrian military is strong enough to fend for itself, thanks largely to Russian assistance, fits with this narrative. It enables Russia to save face despite the fact it has been in Syria months after it declared its mission accomplished. It’s unclear when, exactly, Moscow intends to withdraw its forces. When it does, Iran will be left with only a few options. It can continue to support Assad by spending more on the Syrian war, and begin to commit its air force, which, compared with Russia’s, is dated and dilapidated. Spending more is a difficult proposition for a country in the throes of protests over economic issues. Otherwise, Iran could maintain its current level of support of Assad, but if Russia were to withdraw, Iran would be faced with Israel in its south and Turkey, which also has a modern air force, to its north. Without Russia’s backing, rebels, especially those who benefit from Turkish air support, would stand a better chance of retaking territory that they had lost to Assad. Last, Iran could reduce its presence in Syria and instead focus on gaining greater control of Iraq, which is much closer to home anyway. That, however, presents its own set of challenges, and in any case risks opening up Syrian territory currently serving as buffer space to be taken by Turkey. Though Russia hasn’t yet left Syria, its departure will put even more pressure on Iran and open the Middle East up to Turkey. Russia just needs a public relations victory. Iran’s battle is existential, and there are no clear paths to exit in sight. Nevertheless, fissures in the Iran-Russia relationship, even if just rhetorical, reflect the weakness of Russia’s position in the Middle East. The U.S. president has not abandoned hope that he will be able to pull off the deal of the century even if it now leaves him open to being stood up. If the summit meeting proceeds at all, the United States will go in from a position of strength. The inaugural Lowy Institute Asia Power Index, released this month, finds that the United States remains the preeminent power in Asia — in large part because it retains the most powerful military force and a network of allies in the región. For decades, Trump has shown himself to be allergic to free trade agreements and hostile to alliances. Yet these are the pillars of U.S. power in Asia. His policies in these two fields now threaten America’s standing in the región. Passive investors are about to get more involved in Chinese stocks thanks to MSCI’s decision to include several of them in its key indexes. They will find themselves exposed to a market swimming in leverage. 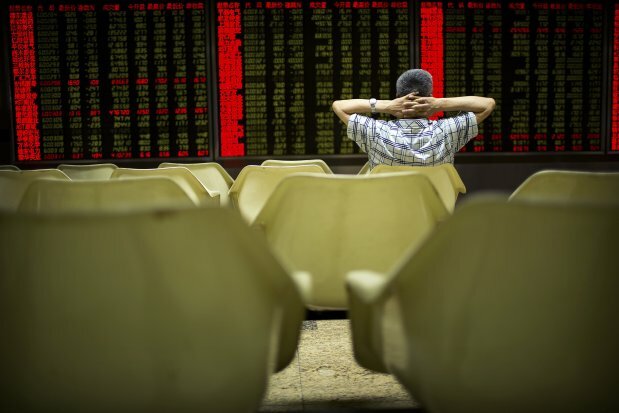 About $1 trillion worth of stocks listed in Shanghai or Shenzhen—China’s two main markets—are being pledged as collateral for loans, according to data from the China Securities Depository and Clearing Corp., or ChinaClear. That’s equivalent to about 12% of the market. Plenty of Chinese stocks are also used as collateral in margin financing, whereby investors borrow to plow more money into stocks. In all, some 23% of all market positions were leveraged in some way by the end of last year in China, according to Bank of America Merrill Lynch. The pledging of shares as loan collateral is particularly prevalent among smaller private companies. Unlike in the U.S., where institutional shareholders are a big market presence, private Chinese firms are often controlled by a major shareholders, who often own more than half of company. These big stakes are the most convenient tool for such big shareholders to raise their own funds. It isn’t always clear where the money they raise ends up. Former technology star Jia Yueting pledged his majority shareholding in Shenzhen-listed Leshi Internet Information & Technology to get funds to fuel his ambitions for the company from electric cars to film studios. The company still suffered a cash crunch last year, after which it was suspended from trading for nine months. 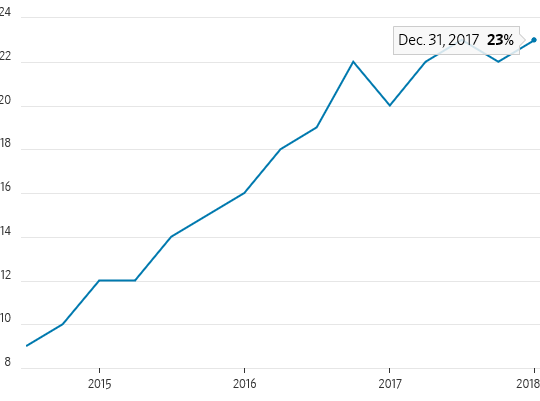 The risk for other investors when big shareholders take out such share-backed loans is that stocks can plunge sharply when the borrowers run into trouble. Hong Kong-listed China Huishan Dairy fell 85% in one day in March 2017: It is unclear what triggered the selloff in the first place, but the fact that Huishan’s chairman had pledged almost all of his majority shareholding in the company to creditors likely made the crash worse. MSCI has limited its coming index inclusion of domestic Chinese shares to only big cap stocks, but that doesn’t mean it is free of problems. Some new entrants such as Kangmei Pharmaceutical , China Grand Automotive Services or Giant Network Group have about half or even more of their shares pledged as collateral for loans, based on data from ChinaClear. Investors thinking of following MSCI’s lead and plunging into Chinese stocks should be aware of such hidden risks.